When I was in middle school, I had a serious obsession with horses. While I think this is fairly normal, I took it pretty far--I used to dream of owning a horse ranch someday, which is particularly hilarious because in reality, I am a city girl through and through. Back then, if I ever say anything with horses on it, I pretty much had to have it, articles of clothing most definitely included. These days, the majority of my clothes are solid colors, and I certainly don't seek out horse patterns. 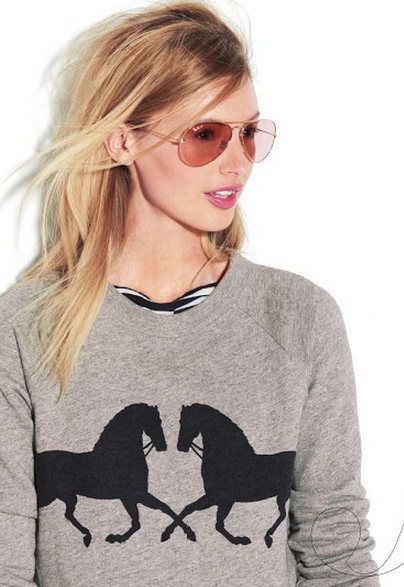 On the other hand, the horse-printed sweatshirts from J. Crew seem fabulously chic and yet comfortable and casual at the same time--maybe I should start styling my sweatshirts the way the J. Crew models have done! The sweatshirt unfortunately seems to be sold out online, but I did see some in store this weekend, so it's still something to consider! The pattern also comes on an iPhone case in the perfect colors for fall, navy and gold. Carrying a phone in this case would be a bit more subtle than wearing the pattern, but either way, I think the preteen in me would be proud of the modern evolution of my love of horses.